Color is everywhere—it’s part of life. Color enhances an experience, such as watching a colorized movie classic. Color creates mood, evokes emotions, and intensifies visual statements. What would happen if stop signs were pink and not red? STOP would loose its visual impact. The fashion and home décor industries are centered on color theory. Graphic designers use color to create brand identity. In fact, colors are so important to a brand, they cause them to become iconic in stature. What would Target be without its red bullseye or McDonalds without the golden arches? When we communicate with color we discover color has various shades, hues, or undertones. If you want something to be “dark blue,” that could be a whole range of options! Designers use several color models, CMYK and PMS. The CMYK color model represents the four colors: Cyan, Magenta, Yellow and Black. Different percentages of these individual colors create more than 10 million color possibilities. In the promotional industry, we use the PMS model to communicate color. PMS stands for Pantone Matching System. Pantone has thousands of colors. If your designer uses PMS 282 (dark blue) in your logo, then I know exactly the color you need to have printed or stitched. All this being said, an exact color match is not always easy, or achievable, when it comes to matching a PMS color to a thread color. There are several reasons exact color matches are difficult. The dyes used to create color in thread are a different from the inks used to create one PMS color. Thread has dimension. Because of this, light refracts differently depending on the angle of the stitches and the light source. Remember when you were a kid and rubbed your hand along the carpeting? As you flattened the fibers in one direction, the color looked different than the rest of the carpet—swipe in the opposite direction, a different color yet. This is what happens with thread. The same color, stitched in different directions, may appear as slightly different colors. PMS colors are created on a white background. When you put that a PMS color on a different colored background it will visually look different. While there are some conversions available, most PMS colors do not have a thread equivalent. Due to the limited number of thread colors, we determine the closest match visually and go from there. What happens if there is not an exact match for the PMS? I can start by looking at what PMS thread equivalents I do have and making a conversion. If you only have a printed copy of your logo (which may or may not be an accurate match) we will do our best, with the experience we have to make a color match. We always want to make the best reproduction of your logo as possible! 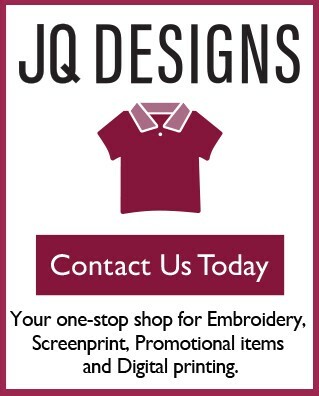 After all, it’s your image, and at JQ Designs, we make YOUR artwork look great!